Thanks to the exhibit at MoMA, I've spent enough time in vintage kitchens this week, so for Flashback Friday it's into the bathroom. This perky 1960 ad turns the tables on the cleanliness-equals-white formula, promoting pink [or, as the manufacturer called it, 'Peachblow'] fixtures as both hip and wholesome. I'm amused by the 'bathroom emancipation' appeal made to parents as part of the sales pitch. 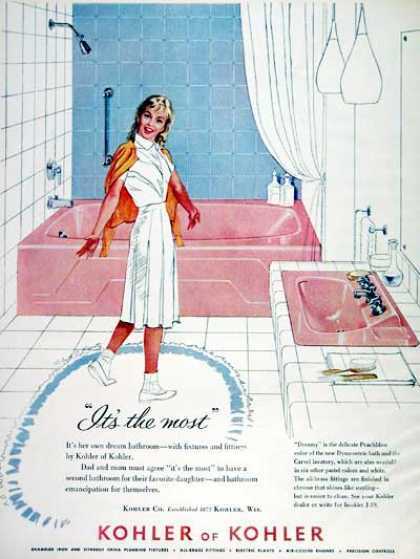 While the Dynametric tub is still in the Kohler catalogue, Peachblow was retired in 1973, after nearly a 40-year run. Kohler features an interesting color timeline on its website, where you can chart the longevity of such hues as Suez Tan, Black Black [not a typo] and my fave, Pink Champagne. I just love these flashback pictures. I can not wait for these colors to be available in universal design features like roll in showers. Good suggestion about the colors, Karisha. Aging-in-place shouldn't have to mean aging-in-monochrome. I just purchased this same vintage kohler add off of etsy. It now lives in my jack and jill bathroom with the the 1960 kohler peachblow bath and sink. Along with orignal pink, white and grey boomerang formica counter tops and vanity. :) Its amazing! It sounds as if your retro bath is now complete, Julie. Long live Peachblow!